Dr. Wayne Marvin Baxter “Rev. Baxter” entered into this world on November 24, 1955 and entered into his heavenly home on November 20, 2018 in Lumberton, NC. He was the son of the late Rev. Christopher Columbus Baxter and the late Sadie Hill Baxter. Rev. Baxter was born in Columbus County, North Carolina. He attended school at Lumberton High School, then entered the workforce. For many years he worked in various industries including trucking, textiles, public schools, and waste management until his health declined. He had the patience and passion unlike a man of his stature. He was a dedicated member of the community and would help anyone who needed him. Rev. Baxter loved fishing, hunting, cooking, and his animals. Often he would give someone a nickname whenever he first meet them. He often talked on the phone speaking with those he encountered about the goodness of the Lord. Overall he had an unwavering love for Christ. Rev. Baxter devoted his life to Christ and was a faithful servant of the Lord. He embraced the call of God his life, and provided spiritual guidance necessary to forming a relationship with God. He was ordained as a minister then completed Shaw Divinity School in 2001. He was a member at Stone Grove Missionary Baptist, Lumberton NC. Shortly afterwards, he became the pastor at Oak Grove Missionary Baptist Church, Fairmont NC. Rev. 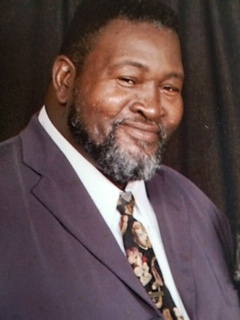 Baxter also served as the senior pastor of Bethesda Full Gospel Church, Lumberton, NC. He truly was a man of God and served faithfully until his transition from this life. He was preceded in death by two sisters, Annie Clark and Ruth Trice, one brother Rev. Leroy Baxter Sr. four brothers-in-law, Charles Overby, Tally McCollum, Calvin McCoy, and Richard McCoy Sr.
Rev. Baxter leaves to cherish his memories, his devoted wife Ada Mae Baxter; three daughters Del’Veria Jackson, Fayetteville NC; Cristina McDougald, Quantica McDougald of Lumberton, NC; son Dwayne Moore, Pembroke NC; five grandchildren Shakeca Faison, Fairmont, NC Jeshaiah Moore, Lumberton NC; Joshua Moore, Norfolk, VA; Jamal Jackson; Wilbur Marenco Jr. of Fayetteville, NC; four great grandchildren Madison Ford, Christopher Ford, Zy’lire Ford, Macie MacArthur all of Fairmont, NC; four sisters Ruby Irene Overby, Nelson, VA; Evangelist Lillie Bell Galloway, Lumberton, NC; Ernestine(Leon)Clemons, Pottstown, PA; Pastor Sarah Baxter Hill, Durham NC; three brothers James(Carneva)Baxter, Bishop Calvin Sr. (Katie)Baxter, Carl Baxter all of Lumberton, NC; four sisters-in-law Deloris Baxter, Vickie Jones of Lumberton, NC; Dwanda McCollum, Peggy McCoy of Fairmont, NC; Margaret McCoy, Pembroke NC; one brother-in-law Larry McCollum; and a host of nieces, nephews, cousins, aunts, uncles, close friends, and his entire church family.